A historical novel that speaks of the reality of war and the loss, love and unity of those who may never have met, For Freedom’s Cause is the first novel in an Australian Dynasty trilogy by Barry Smith. Dan Bevan is a working class English Army Officer from Manchester. Charlie Elliot, a Melbourne Barrister, is serving with the Australian Light Horse. By chance these two chaps meet during the first world war, forming a friendship that lasts several major battles. Barry Smith has done an excellent job of weaving history into fiction, placing the reader into the moment. 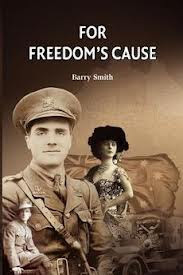 For Freedom’s Cause is written with the knowledge, experience and passion of the scholar Barry Smith is. I enjoyed For Freedom’s Cause but will admit it took me a chapter or two to get into the flow of the writing style. I also found it slightly annoying that all speech was written in italics, finding that I paused each time I came upon the speech, which on some pages was frequently. My brain seemed to need just that moment to register the changes in font. This did make the reading a little slow going in places but did not take away from the great narrative and history lesson of my journey. Being Born in Manchester England and having lived in Australia for over forty years Barry Smith is able to take the reader to the place and time using characters that balance each other and at time draw at the heart strings. For Freedom’s Cause is a book that is ideal for one who wants to touch base with history yet not dig into the often dry factual text book content that is required. For Freedom’s Cause provides a timeline of history and a little bit of journalism in the content of fiction, providing a reading journey that educates and informs in an enjoyable and light manner. I love the historical cover of For Freedom’s Cause. I feel it compliments the story providing an initial visual that sets the scene for the story to come. Within the cover sits patriotic passion, mateship and love. The antiquated sepia tone of the photography leaves a warm historic feel enhancing the personality of the novel. As number one in The Kimberley Trilogy For Freedom’s Cause is followed by Battle For The North. Book three Kimberley Kill is yet to be published. After finishing For Freedom’s Cause I am sure I will be moving on to Battle For The North as I continue the journey with Dan, Charlie and the ladies of their life. They are now part of my life too.